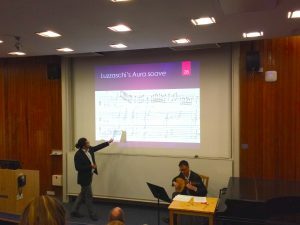 PhD student Grace Newcombe reports on the last Hartley Residency of this academic year: What a delight for the Early Music nerds like myself that the third Hartley Residency of the year was led by Peter Schubert of McGill University. 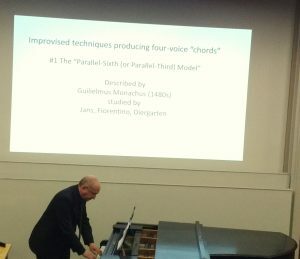 Peter is able to ‘practice what he preaches’ in terms of Renaissance improvisation techniques: his expertise in the crossover and compatibility of theory and practice is particularly well-suited to the current postgraduate community at Southampton, a high proportion of which are performers themselves, and are dealing with Early Music topics. Much of our time with Peter was spent exploring the issues around the modern teaching of Early Music composition and improvisation techniques, when they are no longer living practical traditions. 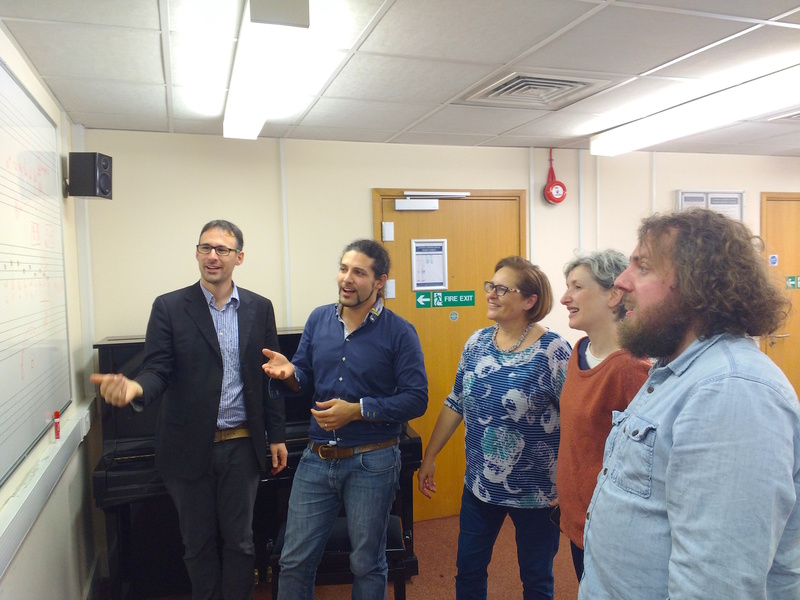 Day One: In the morning, we had the chance to get to know Peter through his informal presentation on the challenges of music theory teaching today. We enjoyed an open discussion with him on our own experiences of learning music theory, and particularly those related to Early Music; much of the postgraduate community had been through paper-based school or university courses such as ‘Realising figured bass’, ‘Species counterpoint’, and ‘Techniques of composition: Bach chorales’, in which the rules of such techniques are learned and reproduced in written exercises. Sure, I can now fill out the missing Alto voice in a Bach chorale, and spot parallel fifths in my figured bass exercise – but have I learned anything about how Bach conceived the chorale? Am I simply analysing it in chordal terms, and thinking at odds with the composer himself? The lack of practical immersion in techniques of composition and improvisation is a problem particularly close to the hearts of two of our postgraduates: In Brescia, Livio Ticli and Marcello Mazzetti are currently reviving the (almost) lost practice of teaching young children to improvise by ear, just as they were taught in the Renaissance. Does paper or practice actually bring us closer to ‘Early Music’? In the afternoon, we enjoyed a formal presentation from Peter, titled ‘Chordal Progressions in the Renaissance?’. Peter introduced us to several improvisation techniques from Renaissance treatises, and addressed the question of if, and at what temporal point, Renaissance composers and improvisers began thinking harmonically rather than in terms of pure counterpoint. Several Renaissance contrapuntal techniques – such as falsobordone, stretto fuga, and invertible counterpoint – may appear chordally-conceived to the modern analyist; but were the composers themselves working with ‘chords’ in mind? As always, the first day of the residency closed with a wine reception in the Arlott Bar, followed by a hearty pub dinner together at the Cowherds. In the afternoon, we enjoyed hearing three of our Early Music peers present their own papers on Renaissance improvisation techniques. 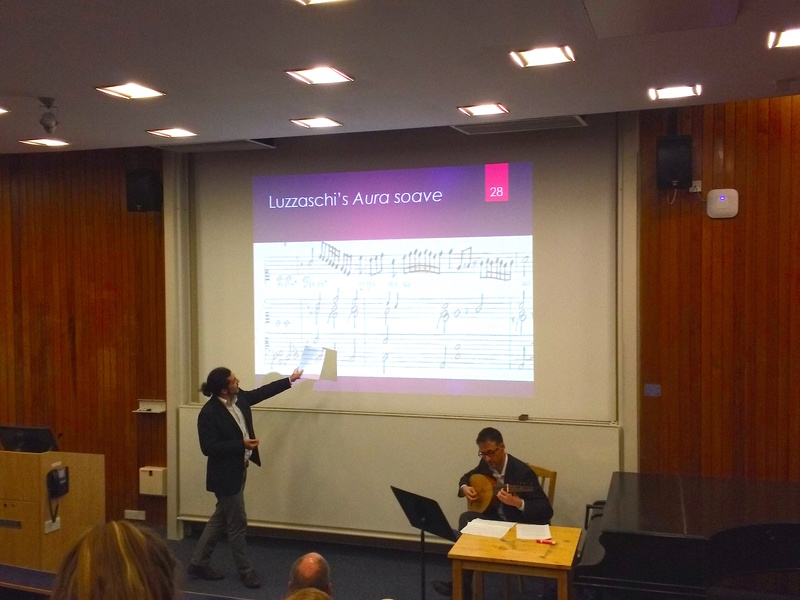 Eric Thomas, first-year PhD student and lutenist, continued on the theme of the previous day with his performance-lecture ‘When is a chord not a chord?’, which discussed contropunto alle mente and the recercares of Francesco Spinacino and Franciscus Bossinensis. He was followed by Marcello, who described the training and practice of singers at Brescia Cathedral to improvise over a cantus firmus in the Renaissance era; should such ‘improvisations’ be genuinely improvised, or written down? 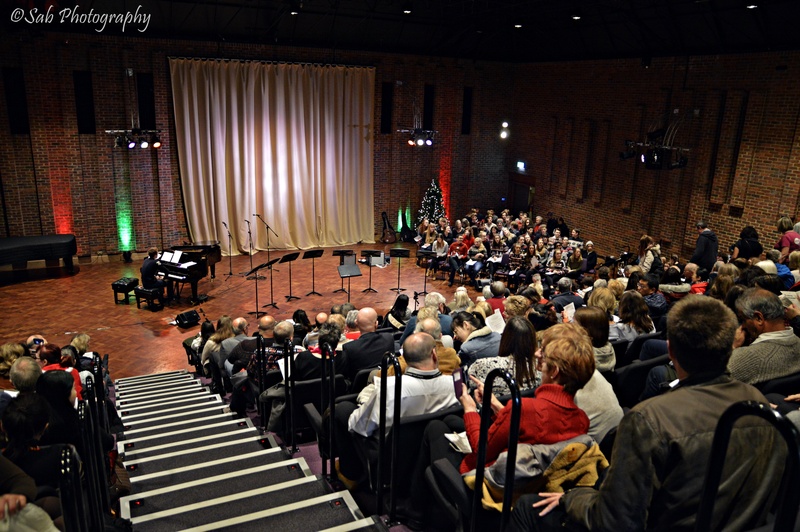 Surely, live singers will make mistakes – does this matter, and did it then? Does the best counterpoint come from composition, or true improvisation? Finally, Livio transported us into the mind-set of a multi-tasking Renaissance performer, and highlighted synergies between vocal, instrumental, poetic and dance forms of improvisation. Unlike the detailed but one-track training in conservatoires today, skilled Renaissance artists would have been multi-instrumentalists, singers, improvisers, and able to dance. Learning by ear and imitation was highly respected; the literary music tradition arrived relatively late in Italy. Are modern performers held back from understanding Renaissance techniques by a lack of confidence in improvising and multi-tasking? The Renaissance skill-set was much broader than that required of performers today. These three ‘student’ presentations were of exceptionally high quality, and what was especially striking was the fact that each presenter put his money where his mouth was in introducing us to the practical aspects of such Renaissance improvisation and compositional techniques. Eric interspersed his talk with live musical examples on the lute, and even closed with his own improvised recercare – which was brilliant. Marcello and Livio treated us to elaborate sung diminutions to the lute – fantastically improvised, of course – and a particular highlight was Livio demonstrating complementary ‘plain’ and ‘ornamented’ Renaissance dance steps to Marcello’s lute accompaniment. At one point, all three presenters were playing together, with the public encouraged to join in singing the cantus firmus (they didn’t need much encouragement). I’m quite sure that by the end of the afternoon, those listening were successfully convinced that practice beats paper as far as understanding the Renaissance is concerned. The residency closed with a Roundtable discussion, in which staff and students were free to share their ideas and questions on what had been a hugely successful, hands-on and inspiring two days of work. As usual, this was the perfect pressure-free zone for students to actively participate in academic discussion with the Southampton music staff, as well as Peter himself. He and the student presenters received a heartfelt and well-deserved round of applause from a room of newly-converted Renaissance improvisers.